Everyone tells you to shop local, drink local, buy local – but sometimes you need a little help, right? 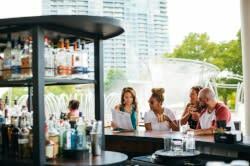 Whether you’re a casual coffee drinker or an experienced connoisseur, Columbus is a great place for you. Here are our tips for ditching the chains and sipping some local coffees. Some Like It Sweet Are sweet coffee drinks your thing, like the ones laced with caramel and whipped cream? Well, Columbus coffee shops have you covered. One Line Coffee serves hot and iced versions of their honey latte. The sweetness is built through Valencia oranges, local honey, caramelized sugar, and browned butter from Hartzler Family Dairy in Wooster. Cafe Brioso plays the sweet game, too, with their Ohio Maple Latte. The latte uses real Ohio maple syrup, which is not too sweet and in fact a tad smoky. Or have you thought of ice cream in your coffee? Fox in the Snow Cafe crafts affogatos, a coffee drink of espresso poured over ice cream. Fox in the Snow’s is particularly decadent, as they use Jeni’s Salted Caramel ice cream! Put a Cap On It The cappuccino and all of its dolled-up versions are often at the center of coffee service. 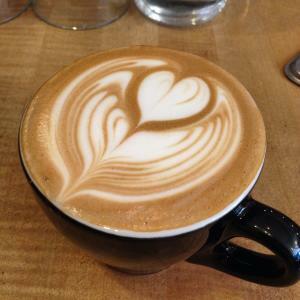 Many Columbus coffee shops create superb cappuccinos using local Snowville Creamery or Hartzler Dairy milk. In the Short North, Impero Coffee has won a lot of fans for their coffee beans and prepared drinks like their creamy cappuccino. You can also find the Bexley Coffee Shop makes their cappuccino with Thunderkiss Coffee. It’s a tasty treat with their homemade baked goods. Keep It Clean Maybe you’re not into dressing up your coffee. You like it clean and straightforward. Then a pour-over is for you! Dayton-based Boston Stoker has been serving quality coffees to campus crowds for a couple years, but they’re moving south to make a home in Victorian Village. They post a daily list of coffees available as pour-overs. Likewise, Luck Bros was one of the first shops to add a brew bar. You can watch your coffee skillfully crafted by the barista one cup at a time with their Clever coffee drippers. The Strong Arm Maybe you like your coffee strong but want to keep the volume low. What do you say to a shot of espresso? At UpperCup Coffee the espresso is made old school, with hand-pulled espresso machines. The baristas at Stauf’s Coffee Roasters’ three locations are also skilled in different methods of pulling espresso, giving you a rich and creamy shot of caffeine. Put It On Ice Iced coffee is a sure bet during the summer months, when a cold cup of java is the perfect pick-me-up. Crimson Cup Coffee House offers the only cold brew coffee in town on nitro tap. The nitrogen imparts a super smooth texture to the brew. They also rotate a seasonal cold brew that’s flavored with everything from hops to cinnamon to cocoa nibs. Mission Coffee also crafts a cold brew coffee that they serve from a three-wheeled bicycle around town. Looking to experience more Columbus coffee? Head out on the Coffee Trail!